What started as a single-stage music showcase put together in 1991 by Perry Farrell, lead singer of Jane&apos;s Addiction, has since evolved into a larger-than-life music experience like no other. Connecting with the city&apos;s deep musical legacy, Lollapalooza set down roots and made Chicago its home in 2005—and it hasn&apos;t looked back. Now a destination event, thousands of fans travel from around the world to experience the massive crowds, scenic lakefront setting, and incredible entertainment every summer. This year&apos;s lineup includes a star-studded list of headliners: Ariana Grande, Childish Gambino, Twenty One Pilots, the Strokes, Tame Impala, Flume, the Chainsmokers and J Balvin. Other notable acts include Kacey Musgraves, Janelle Monáe, Lil Wayne, Death Cab for Cutie, Hozier, Tenacious D, Mitski and Meek Mill. The outdoor festival has grown to four days featuring 170+ artists on eight stages. This year&apos;s performers blend music&apos;s best and newest acts into a genre-bending lineup, including hip-hop, electronica, indie, rock, modern roots, and beyond. Explore the full list of acts at lollapalooza.com/lineup/. Those lucky enough to score tickets take to Grant Park&apos;s 115 acres of open green space and rock out to music against the backdrop of Chicago&apos;s magnificent skyline. Admission tickets range from single day to weekend passes, to VIP and Platinum Passes, and are available for purchase in advance at lollapalooza.com/tickets. Visiting Chicago but missed out on Lollapalooza tickets? Fans now have the chance to purchase through the Official Ticket Exchange, which is Ticketmaster-verified. There&apos;s plenty to do between sets. Besides a passion for music, the Lollapalooza experience emphasizes art, food, fun and community, as well as ongoing efforts to create an environmentally friendly event. 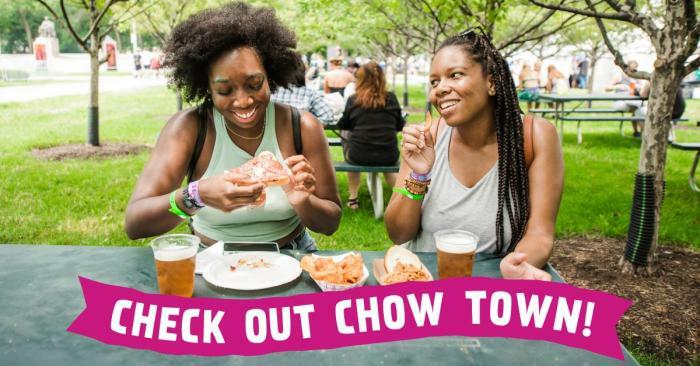 The 30+ vendors at Chow Town feed the hungry masses with the most refined of festival foods. Curated by local celebrity restaurateur Graham Elliot, the culinary lineup at the two food courts rivals the star quality on the main stages. Local cuisine takes the spotlight here, with a spin of course...think lobster corndogs and spicy mongolian beef baos. With workshops, activities and child-friendly music all day, Kidzapalooza is a festival within a festival for young music fans. If this and the 10 hours of music each day isn&apos;t enough of a sensory overload, other rocking activities at Lollapalooza include an Art Market, sponsor lounge parties, recharge stations and autograph tents. For the ultimate music experience in Chicago, or for those who may have missed out on tickets to the festival, immerse yourself in the local club scene at some of the official aftershows. Many Lollapalooza acts play at notable Chicago venues such as Metro, The Vic Theatre, House of Blues, Lincoln Hall and Schubas leading up to the main event and after the fest. A number of hotels for all budgets are conveniently located near Grant Park and in the nearby Loop. Book Chicago hotels for Lollapalooza, or view our Chicago hotel guides for spotlights on cool hostels and hip boutique hotels like the Freehand Chicago, Fieldhouse Jones or The Hollander. For the full schedule, latest updates and detailed ticket information, visit the official website: www.lollapalooza.com.